100% BPA Free - Our fruit infuser water bottles are manufactured 100% BPA FREE which allows for long infusion periods without worrying about harmful chemicals seeping into your beverage. Indestructible Tritan Plastic - This water bottle is manufactured with commercial grade Tritan which is BPA Free, dishwasher safe and virtually indestructible. The bottle is extra thick and durable. 100% Leak Proof - Our infuser water bottle is 100% leak proof and can be shaken vigorously, carried upside down and sideways without leaking any of your water. 100% Satisfaction Guarantee - If you're not completely satisfied with your FruitSplash infuser water bottle, we will gladly refund or replace your item! FruitSplash promote healthy living through stylish and highly functional waterbottles for sports and outdoor recreation use. Its versatility allows fordaily use to keep users hydrated and stylish. New Functional Design - Large compartment allows plenty of room for fruit, tea and other infusing products. Perfect for the gym, office, beach, home or car. This fruit infuser water bottle is versatile with removable fruit infuser and functions as sports water bottle, infusion pitcher, water infuser or tea bottle with infuser. Sport Design - Functional lid that can clip onto different straps and includes integrated one-hand easy open/close drinking spout 100% BPA Free - Our fruit infuser water bottles are manufactured 100% BPA FREE which allows for long infusion periods without worrying about harmful chemicals seeping into your beverage. Indestructible Tritan Plastic - This water bottle is manufactured with commercial grade Tritan which is BPA Free, dishwasher safe and virtually indestructible. The bottle is extra thick and durable. 100% Leak Proof - Our infuser water bottle is 100% leak proof and can be shaken vigorously, carried upside down and sideways without leaking any of your water. 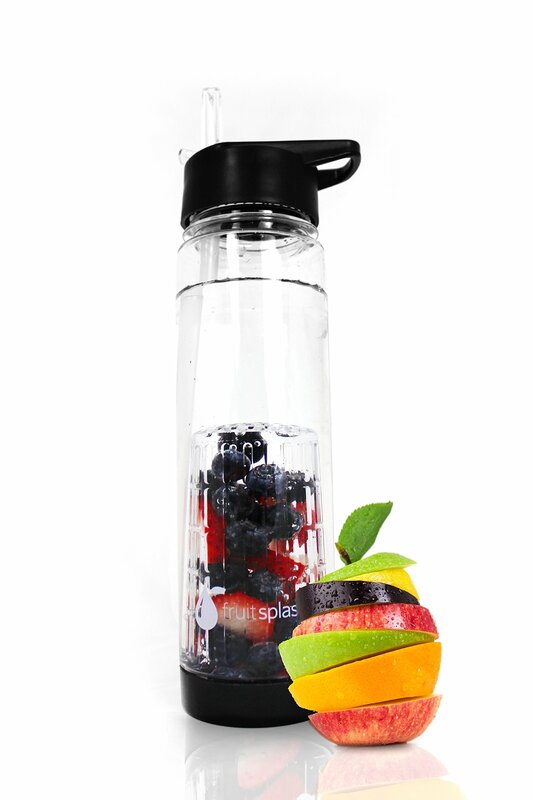 100% Satisfaction Guarantee - If you're not completely satisfied with your FruitSplash infuser water bottle, we will gladly refund or replace your item!